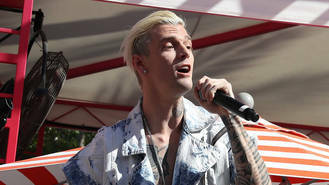 Aaron Carter has acknowledged concerns over his health after being told he looks like he’s “dying”. The 29-year-old musician has had a tough few months in the spotlight, which has seen him arrested for driving under the influence, coming out as bisexual and being involved in a car crash. His gaunt exterior has also worried fans and those close to him, as has his drug use, and it seems Aaron has finally acknowledged those concerns. Breaking down in tears during a teaser clip for an upcoming episode of TV show The Doctors, the blonde star explains, “I’m concerned about my overall health because people tell me I look like I have AIDs or I look like I have cancer or I look like I’m dying. Aaron underwent a drug test during his appearance on the programme, which came out negative for both cocaine and methamphetamine and positive for marijuana. But Dr. Travis Stork described the singer’s combination of prescription medication, "benzodiazepines with opiates" as "very, very scary” and potentially fatal. Even more so as the singer's sister Leslie aged 25 in 2012 after an overdose. The I Want Candy singer went on to recall how “scary” it was to say goodbye to her as she lay in a coffin. Lady Gaga has scrapped her appearance at the Rock in Rio festival because she's not well enough to make the trip to Brazil. Singer Fergie has separated from her actor husband Josh Duhamel after eight years of marriage. Shawn Mendes was "terrified" after being held in an armlock by Drake's security guard at a recent gig. Singer Adam Levine and his wife Behati Prinsloo are expecting baby number two. Jennifer Lopez's relationship with Alex Rodriguez is the first time she's been part of a couple that "make each other better". Kelly Clarkson has dubbed her first five years in music "hell". The chronic pain Lady Gaga has suffered for years is the result of fibromyalgia. Selena Gomez and The Weeknd are reportedly renting an apartment together in New York. Lady Gaga has urged Madonna to "push me up against a wall and kiss me" to end their long-running feud.